U.S. Rep. Joseph P. Kennedy III. 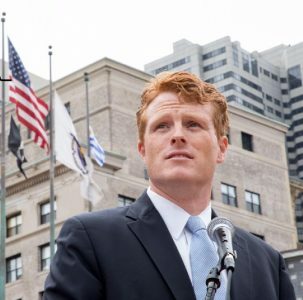 Congressman Joe Kennedy III (D-MA) will visit Chester County on Wednesday, May 30 to present keynote remarks at “Vision of the Future”, being held at West Chester University at 5:00pm. He is the first premier guest the Chester County Young Democrats welcome to encourage political awareness and involvement ahead of the 2018 midterms. “To have such a young, engaging Congressman come to West Chester will certainly energize younger voters in Chester County while reminding senior Americans of a more civilized political discourse during the Kennedy era” said county Democratic Chairman Brian J. McGinnis. “I’m honored to help the county Young Democrats establish themselves as a potent engine for younger progressives to feel welcome and engaged within our party”. “Vision of the Future” will also mark the unofficial kickoff to the 2018 general election period, following the Pennsylvania primaries on Tuesday, May 15. Tickets are on sale now at facebook.com/chescoyoungdems. Young Democrats President Hans van Mol stresses “this event is a chance for progressives both young and ‘young-at-heart’ to focus on a future that benefits all Americans, not just the select few. With basic American values under attack by the Republicans’ extreme agenda, neighbors are asking what Democrats can do for their country. Attending this event is a good step”. Joe Kennedy III, 37, leads a new chapter of the Kennedy family legacy following his election to represent Massachusetts’ 4th congressional district in 2012. His grandfather was Attorney General Robert “Bobby” Kennedy, and his grand-uncles include former President John F. Kennedy and longtime Senator Ted Kennedy. A graduate of Harvard Law School, Kennedy III is a member of the Congressional Progressive Caucus and is considered a “rising star” after delivering the Democratic Response to the State of the Union Address in 2018. The Chester County Young Democrats is the official youth wing of the Chester County Democratic Committee and is committed to the engagement and political development of young adults in the county. Membership is open to registered Democrats ages 40 and under.